263 Beacon is located on the south side of Beacon, between Dartmouth and Exeter, with 261 Beacon to the east and 265 Beacon to the west. 263 Beacon was built ca. 1871, one of four contiguous houses (263-265-267-269 Beacon) designed as a symmetrical composition, with 263 and 269 Beacon having two-story oriels, defined mansards, and slightly projecting facades, and 265-267 Beacon having one-story oriels. Click here for an index to the deeds for 263 Beacon. By 1874, 263 Beacon was the home of banker and trustee Charles Merriam and his wife, Helen (Jaques) Merriam. They previously had lived at 12 Beacon. They also maintained a home in Nahant. 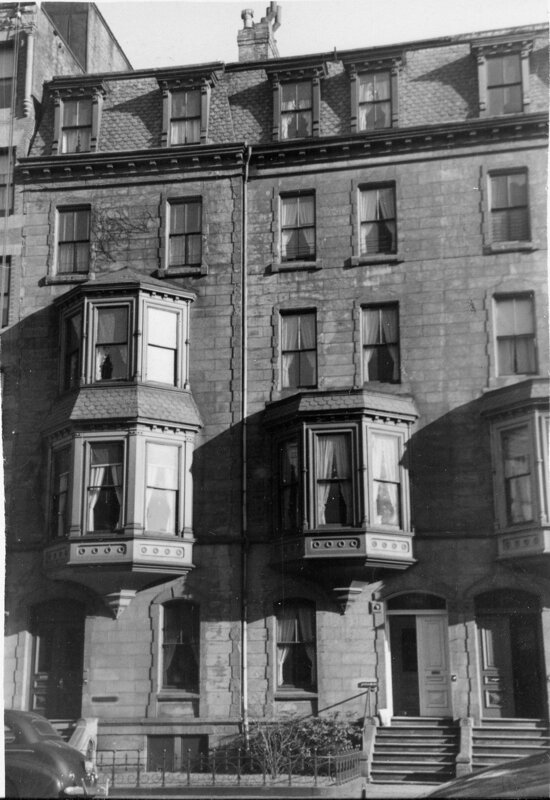 They continued to live at 263 Beacon in 1882, but moved soon thereafter to the new home they had built at 175 Commonwealth. 263 Beacon was not listed in the 1883 Blue Book. By the 1883-1884 winter season, 263 Beacon was the home of Eben Dyer Jordan, Jr. and his wife, May (Sheppard) Jordan. They had been married in November of 1883 and 263 Beacon probably was their first home together. He was a partner in his family’s dry goods and department store, Jordan, Marsh and Company. The Jordans continued to live at 263 Beacon during the 1890-1891 winter season, but moved to Brookline thereafter. 263 Beacon was not listed in the 1892 Blue Book. On January 9, 1892, 263 Beacon was acquired from Eben D. Jordan, trustee, by Dr. Herman Frank Vickery, a physician. He and his wife, Abbie Williams (Davis) Vickery, made it their home and he maintained his medical office there. They previously had lived (and he had maintained his office) at 37 Hancock. Abbie Vickery died in October of 1911. Herman Vickery continued to live at 263 Beacon and in August of 1915 he remarried to Annie Louisa (Bigelow) Howe, the widow of Dr. James Sullivan Howe, a physician. 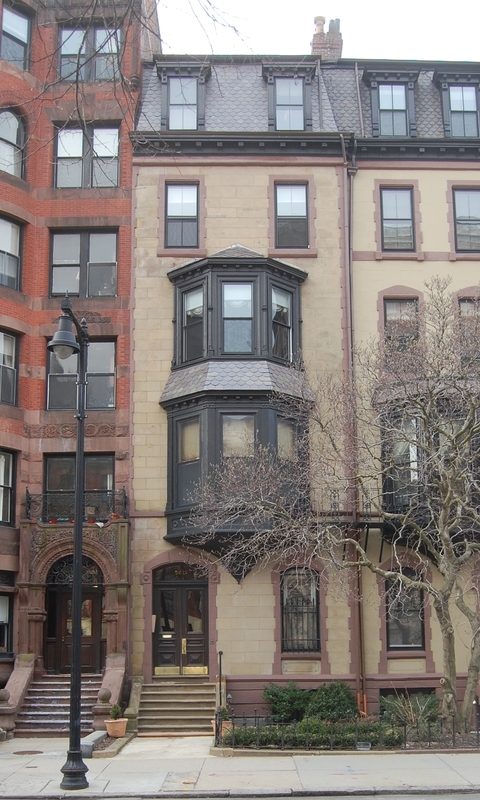 After their marriage they lived at 263 Beacon until about 1917, when they moved to Brookline. On May 25, 1917, 263 Beacon was purchased from Herman Vickery by Dr. Francis Minot Rackemann, a physician specializing in asthma and allergies. He and his wife, Dorothy (Mandell) Rackemann, made it their home. They had married the previous month. They also maintained a home in Cataumet, Massachusetts. In June of 1917, his father, attorney Felix Rackemann, filed for (and subsequently received) permission to extensively remodel the interior, with the work designed by architects Bigelow and Wadsworth and built by Norcross Brothers. After the remodeling, 263 Beacon also became Francis Rackemann’s medical office. From April of 1918 through May of 1919, Francis Rackemann served as a Lieutenant in the US Army assigned to the base hospital at Camp Merritt in Hoboken, New Jersey. During the 1918-1919 winter season, while the Rackemanns were in New Jersey, 263 Beacon was the home of William Francis Warden and his wife, Eleanor Cotton (Denham) Warden. They had lived at 105 Marlborough during the previous season. He was an artist and, prior to the outbreak of World War I, they had lived in Paris for a number of years. 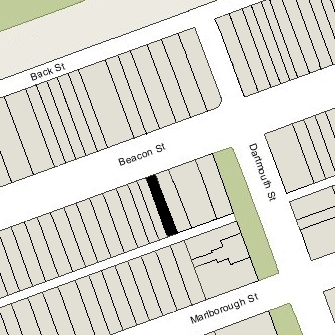 By the 1919-1920 season , they had moved to 257 Marlborough and 263 Marlborough was once again the Rackemanns’ home. In about 1928, Dr. Rackemann leased space at 261 Beacon for his offices. In December of 1928, he filed for (and subsequently received) permission to remodel 261 Beacon and cut a door through to 263 Beacon, connecting his home with his office. He continued to maintain his office there until the early 1950s, when he moved it to 266 Beacon. Dorothy Rackemann died in March of 1965. Francis Rackemann continued to live at 263 Beacon until his death in March of 1973. On August 24, 1973, 263 Beacon was purchased from Francis Rackemann’s estate by Diana Barrett, a real estate consultant and developer. In October of 1973, she filed for (and subsequently received) permission to convert the property from a single-family dwelling into five apartments. In 1975, Diana Barrett married Robert J. (Bob) Vila, a contractor and restoration specialist, who, from 1979 to 1989, was host of the Public Television series “This Old House” about the renovation of vintage homes. 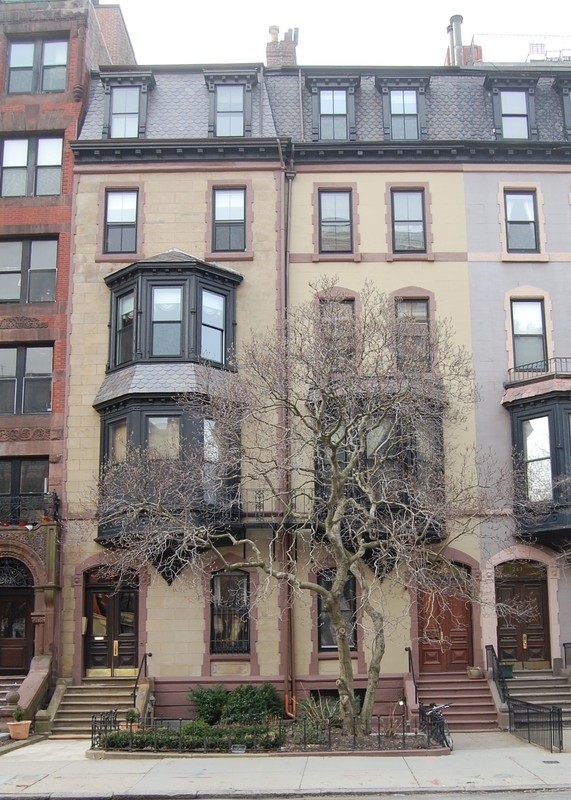 On July 26, 1985, Diana Barrett converted 263 Beacon into five condominium units, the 263 Beacon Street Condominium.